1956 Buick Showroom Display – restore it or not? The 1956 Buick Showroom Display is one of the rarest marketing items for its year. We've stumbled upon its pieces and are considerring a rebuild. Read more! We've been fortunate to buy a few more issues of the Buick Magazine. There only a few left that we need to find! See the updated section! This is one of the rarest items of our collection - a wooden box with 50 unique slides in it. 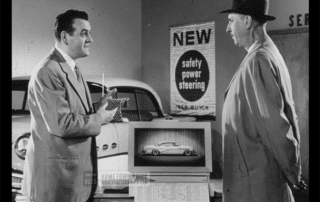 See more about the 1954 Buick Salesmen Presentation! The list of 1958 Buick Options & Accessories is now complete and online! We've added the 54 Buick introduction radio spot. Have fun! Learn more about one of the rarest items for 1954 Buicks - the 1954 Buick Colors & Fabrics Book! The first digitalized Buick radio spot is online! Listen to the 1952 Buick radio spot! Hoorray! After years of work, we're online! We hope all owners and fans of 1950s Buicks enjoy our website!